A medium profile meter interbase adapter at a depth of 3.5 inches. Features a one-piece injection molded polycarbonate shell and clear polycarbonate shield to prevent contact with live components. The EK Series accommodates a variety of interface devices such as whole house disconnect switches, PC boards, surge suppression equipment, communication inter- faces and recording devices. Available in bulk kit form for OEM applications. Many standard models are UL Listed (consult factory). 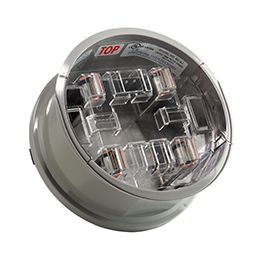 Designed to allow for ease of connecting interface devices to ring or ringless sockets. 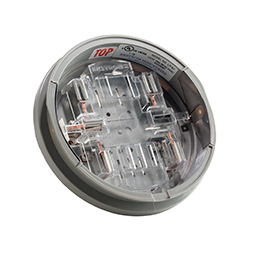 For ringless sockets applications the meter interbase adapter can be inserted into the socket and socket cover reinstalled before sliding the coupler into the adapter. Utilizes the medium profile extender adapter at a depth of 3.5 inches. Features a one-piece injection molded polycarbonate shell and clear polycarbonate shield to prevent contact with live components. 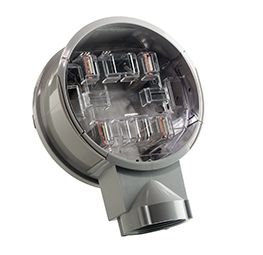 The Slide Coupler has a standard 2” threaded conduit hub as portal into the meter adapter and 4-hole bolt pattern to attach separate enclosures for applications including cellular communications, power quality interface and recording devices. Numerous kits and adapters available (consult factory). 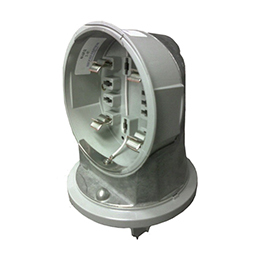 A deep profile meter interbase adapter at a depth of 5.25 inches. Features a one-piece injection molded polycarbonate shell and clear polycarbonate shield to prevent contact with live components. The EKD Series accommodates a variety of interface devices that may require additional interbase real estate. Available in bulk kit form for OEM applications. Many standard models are UL Listed (consult factory). 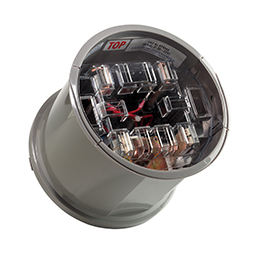 The lowest profile meter interbase adapter in the industry at a depth of 1.2 inches. Features a one-piece injection molded polycarbonate shell and clear polycarbonate shield to prevent contact with live components. Available in four through eight jaw models. Accommodates an RJ-11 telephone jack for direct access. Available in bulk kit form for OEM applications. Many standard models are UL Listed (consult factory). Brooks Right Angle adapter is perfect for meters that are difficult or impossible to read due to awkward location or obstructed view. Fits ring or ringless style sockets. Accepts hardened security rings. Places the meter at an 85° angle. Read left or right. R,L designation in part number on 7 and 13 jaw models indicates the direction the meter will face when viewing the socket from the front.